In bygone eras, people were known by the types of employment they had and also which types of things they were skilled at making. If a person was a particularly accomplished spinner or weaver, for instance, people sought them out to have them make their thread or cloth. If someone was excellent at woodworking, they’d be hired for that purpose or their expertise would be sought for the purposes of an apprenticeship. In our current society, many people have interactions with devices & technology, but interactions with actual items that require a great deal of skill and training is beginning to fade. Most children today can operate a device that holds playlists for listening to music, for instance, while making music on an actual instrument takes a great deal more skill, attention & training. If you’d like to read more on this subject, the book “Shop Class as Soulcraft: An Inquiry into The Value of Work” by Matthey B. Crawford is an excellent read. For millinea however traditional handcrafts have been a way of life. Up until the last 40-50 years, in fact. These skills have been a source of warmth (sewing, knitting, crocheting, quilting), a source of shelter/refuge (woodworking, log building, cabinetry), a source of beauty (tatting, rosemauling, painting), a source of function (pottery, ceramics, chair caning), etc. Many of these skills have been replaced during the Industrial Revolution by machines, but at great cost to us as a culture. Not only are we losing the ability to be able to make things by hand, we lose the benefits that go along with these crafts. Knowing how to knit provides a utilitarian purpose of forming something warm out of one long length of yarn, but it provides much more than that. 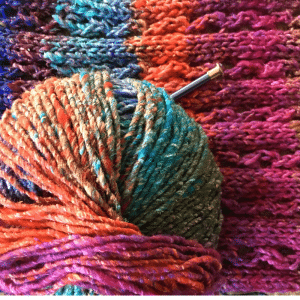 Recent studies show that the impact of using both hands in knitting forces the brain to cross the midline & helps children & adults to be able to think more fluidly in both hemispheres. It is also a calming activity which can help with anxiety. It is also something useful to do when you no longer have the energy for strenuous physical activity. These skills were taught from an early age, young children of 4-6 were often quite adept at knitting in Scandinavian countries. The interactions between older generations & younger generations was a normalcy rather than an anomaly. Many handicrafts have various benefits like these that are being largely overlooked in the frenzied age in which we live. It need not be terribly complicated. You are not required to be a master at whichever skill you hope to pass on to a younger generation. Even if you learned a skill in the “wrong” way, you can pass on your knowledge of that. Elizabeth Cotton, a famous folk musician, learned to play guitar upside down. Years later, Jimi Hendrix would also be known for this particular style of playing guitar, now know as “playing Cotton”. No excuses! 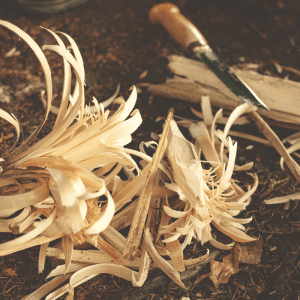 If you know how to do basic woodcarving, show someone else the skill, whether they are younger or older. Teach them how to hold the tools that you use, which types of wood work best & some useful thing they can create with the skill. If you know how to crochet, but only know 6 or 7 stitches, teach someone else the basics of crocheting & to be familiar with the fibers they’re working with. Once people have overcome the obstacle of learning basic skills, you’d be amazed at the hunger for more. If you cannot provide the answers to their questions, it is okay. They will seek out others who have different skills in the same area & further their education. If they cannot find someone with the skills they would like to cultivate, they’ll research in books & on the internet for those skills. Do not let imperfection keep you from the benefits of passing on or learning a new skill. These interactions between the generations provide useful skills, but they also provide mental health benefits for the elderly & young generations alike. For the elderly, it takes away some of the loneliness in later years & gives them a sense of purpose & that the world is going to be okay even after they’re gone. For the younger generation, it gives them a sense of calm & rootedness to know where they’ve come from and that they will survive. Finally, if you have no skills such as I’ve mentioned above & know no one with these skills (which is highly unlikely, but possible), you can always search online to learn the skills. If you do this, be sure to share them with others directly, however. A large part of the benefit is in teaching one another in person, in having direct communication, immediate answers to your questions, and accountability to finish the project you’ve started on. Handicrafts are of great benefit to all involved. If you are looking for someone with a particular skill, a great place to search is at your local county fair. Oftentimes artists & craftspeople will display their work for others to enjoy at the fair. Also search for groups or guilds in your area online, then call to inquire about someone who can teach a beginner. Yarn shops often have classes on knitting & crocheting. Fabric stores often have quilting classes. You’ll be surprised at how much is available once you start asking around. People want to share these things!